People are often surprised to discover that education received at a chiropractic college is quite similar to the education received in medical school. Candidates for chiropractic college must complete a minimum of three years of college-level courses prior to entering school and completion of a doctor of chiropractic degree requires four to five years of professional coursework. 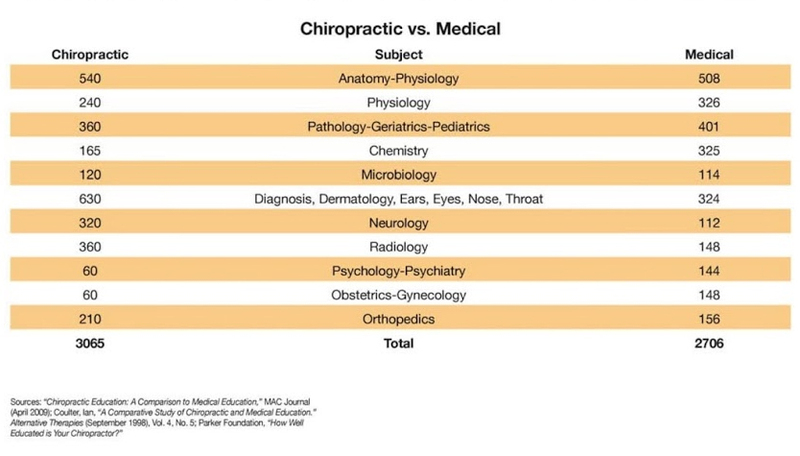 Also, the education of a chiropractor is similar in total classroom hours to that of a medical doctor. Doctors of chiropractic receive more training in anatomy and physiology while physician received more training in public health. Chiropractic colleges focus on chiropractic principles, diagnosis, orthopedics, physiologic therapeutics and nutrition. Three areas – manipulative/adjustive technique/spinal analysis, physical/clinical laboratory diagnosis and diagnosis imaging – account for more than half of the education in clinical sciences. During their internship, doctors of chiropractic complete two years of hands-on clinical experience focusing on manipulation/adjustment as the primary treatment procedure. Studies show that chiropractic students receive more training than their medical counterparts in the following areas: anatomy, physiology, bacteriology, diagnosis, X-ray and orthopedics. They also show that chiropractic institutions actually devote more time to the basic and clinical sciences than do medical schools.